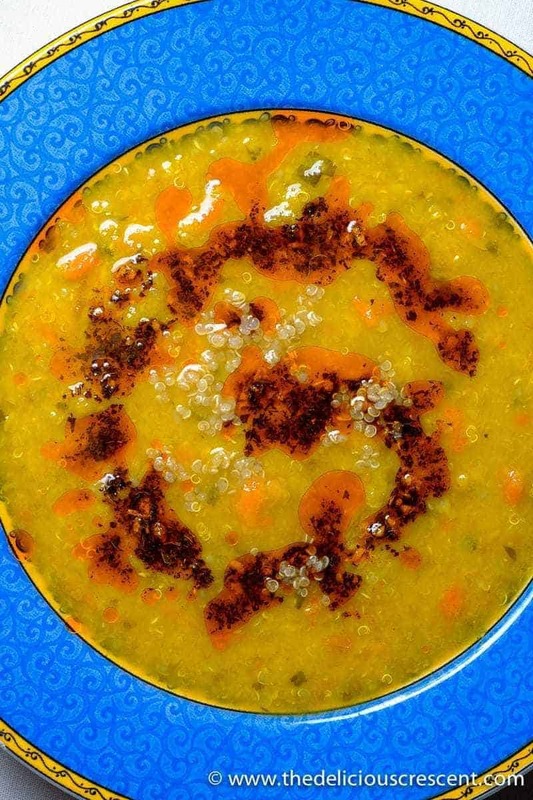 This is my version of the famous red lentil soup from Turkey. It has additional herbs and spices. I have added quinoa to give an interesting texture. Quinoa can be used to create remarkable textures such as in this recipe – Vegetarian Kotlet with Eggplant (Quinoa crusted chickpea patties). Another lentil recipe with Mediterranean flavors is my Lentil Salad with Avocado. And then this delicious and stunning Persian Lentil Rice with Cranberries. Red lentils are protein rich and loaded with fiber. These two nutrients together also make red lentils a very satiating food despite being low in calories. Studies have shown that red lentils have maximum concentration of phenolic compounds and with strongest antioxidant activity compared to other varieties of lentils. Quinoa has been much touted for its nutrition value. It is a good source of antioxidants and considered to provide complete protein. Although it is referred to as a whole grain it is actually a pseudo cereal with nutritional quality similar to that of grains but with higher protein content. It has been found to be nutritionally beneficial for several health conditions such as diabetes, colon cancer, hypertension and obesity. This Mediterranean red lentil soup is also gluten free for those who prefer or need that in their diet. Meanwhile, heat the olive oil in a small saucepan. When the oil is hot, turn off the heat. Add the paprika, mint and ground red pepper (optional). Make sure to take the saucepan away from the heat source, so that the seasonings do not get burnt. Ground red pepper adds the characteristic pungency and you may want to add it per preference and taste. Stir about one fourth of the paprika-mint seasoning oil into the soup to allow the flavors to mix well into the soup. Ladle the soup into serving bowls and drizzle the remaining seasoning oil on top of the soup. 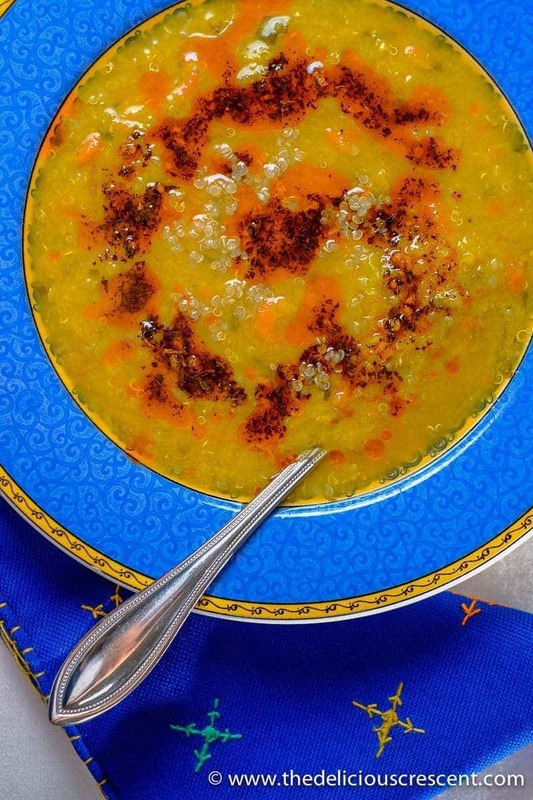 Serve some lemon wedges on the side with this Mediterranean red lentil soup. May use vegetable stock to make it "vegan". Thanks Amy. So happy you like it. This soup looks so rich and delicious. I have all of the ingredients so dinner is done for tomorrow night. Thanks! I love this soup, the mint really makes it. Thanks. Yes you are absolutely right. I love the sound of this…craving a bowl right now! I am all about quinoa all the time! And I love red lentils, but don’t eat them as much. This soup is such a healthy and delicious combo! Thanks Sues. I love quinoa too.